Cactus heyderi var. hemisphaericus (Engelm.) J.M.Coult. Mammillaria heyderi var. hemisphaerica (Engelm.) Engelm. Mammillaria heyderi var. bullingtonia Castetter, P.Pierce & K.H.Schwer. Mammillaria gummifera Engelm. in Wisliz. Mammillaria heyderi var. applanata (Engelm.) Engelm. 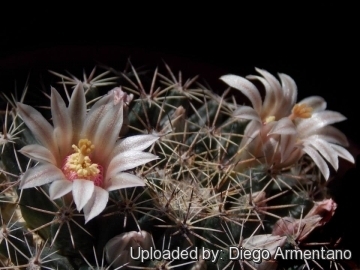 Description: Mammillaria heyderi subs. 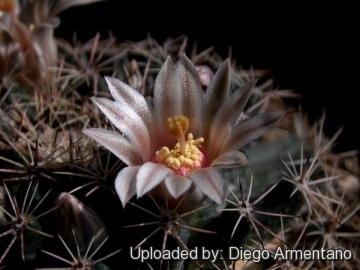 hemisphaerica is one of the subspecies of Mammillaria heyderi which is one of the most widespread and morphologically variable taxon. 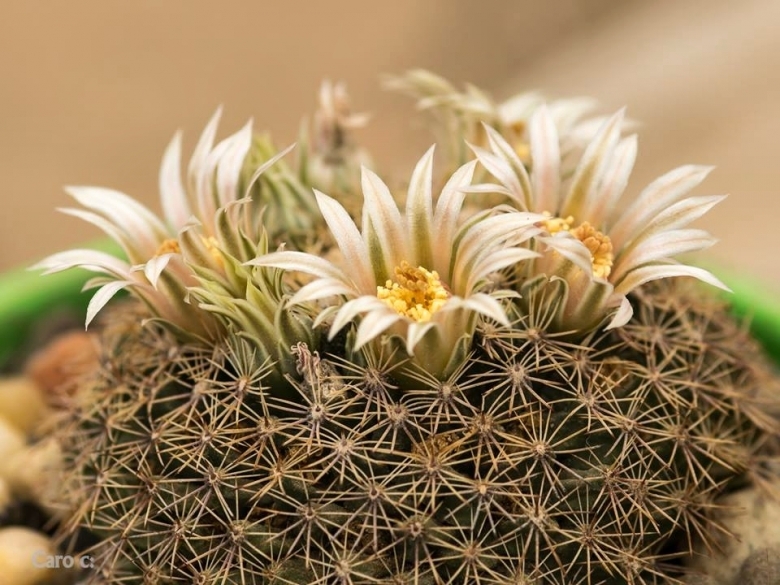 It is a flattened-globular cactus (often very flat) distinguished from the type species for having 1 central spine and 9-13 radial spines. Flowers are Cream-coloured to dusty pink. Mammillaria heyderi Muehlenpf. : It has 1 central spine and 15-22 radial spines; Flowers are cream coloured with brownish-greenish mid-veins. 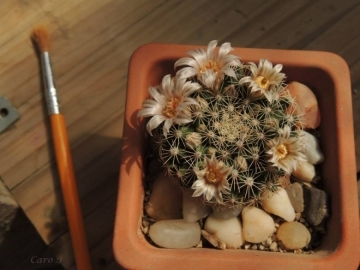 Mammillaria heyderi var. applanata (Engelm.) Engelm. : It is often the flattest but otherwise very similar to the The ssp. heyderi and may probably repesent only a race of the same species. Mammillaria heyderi subs. 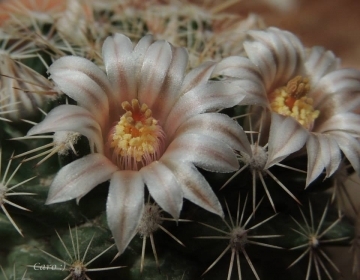 gaumeri (Britton & Rose) D.R.Hunt: It has one central spine and 10-12 radial spines; Flowers are plain creamy-white. Mammillaria heyderi subs. gummifera (Engelm.) 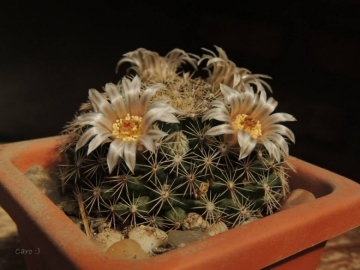 D.R.Hunt: It has 1-2 central spines and 10-12 radial spines: Flowers are reddish-white with darker midviens. Mammillaria heyderi subs. hemisphaerica (Engelm.) D.R.Hunt: It has 1 central spine and 9-13 radial spines; Flowers are Cream-colored to dusty pink. Mammillaria heyderi subs. macdougalii (Rose in L.H.Bailey) D.R.Hunt: It has 1-2 central spines which are stouter and 10-12 radials spines; Flowers are cream-colored to pale yellow. Mammillaria heyderi subs. meiacantha (Engelm.) D.R.Hunt: It has one to none central spines and 5-9 radial spines; Flowers are pink or white with pink mid-viens. Cultivation and Propagation: This is an easy to grow species, don't requires any special treatment, but need as much light as possible without burning the plant to encourage the heaviest spine formation. Needs a very good drainage with regular water in summer, dry in winter. Avoid any frost. Propagation: Seeds, offsets (Allow cut surface to callous over before planting).